Israel does not want a Palestinian state. Period. What will we tell the world next week, at the UN? What could we say? Whether in the General Assembly or the Security Council, we will be exposed in all our nakedness: Israel does not want a Palestinian state. Period. And it doesn’t have a single persuasive argument against the establishment and the international recognition of such a state. So what will we say, that we’re opposed? 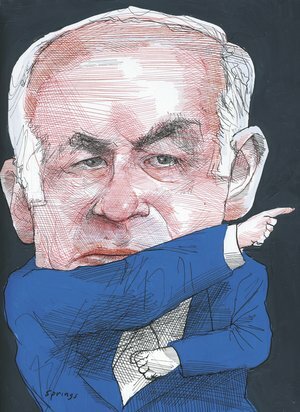 Four prime ministers, Benjamin Netanyahu among them, have said that they’re in favor, that it must be accomplished through negotiations, so why haven’t we done it yet? Is our argument that we object to it’s being a unilateral measure? What’s more unilateral than the settlements that we insist on continuing to build? Or perhaps we will say that the route to a Palestinian state runs through Ramallah and Jerusalem, not New York, a la the U.S. secretary of state. The State of Israel itself was created, in part, in the United Nations. Next week will be Israel’s moment of truth, or more precisely the moment in which its deception will be revealed. Be it the president, the prime minister or the ambassador to the UN, even the greatest of public speakers will be incapable of standing before the representatives of the nations of the world and explaining Israeli logic; none of the three will be able to convince them that there is any merit to Israel’s position. Thirty-two years ago, Israel signed a peace agreement with Egypt in which it undertook “to recognize the legitimate rights of the Palestinian people” and to establish an autonomous authority in the West Bank and Gaza Strip within five years. Nothing happened. Eighteen years ago the prime minister of Israel signed the Oslo Accords, in which Israel undertook to conduct talks in order to achieve a final-status agreement with the Palestinians, including the core issues, within five years. That, too, did not occur. Most of the provisions of the agreement have foundered since then – in the majority of cases because of Israel. What will Israel’s advocate at the UN say about this? For years, Israel claimed that Yasser Arafat was the sole obstacle to peace with the Palestinians. Arafat died – and once again nothing happened. Israel claimed that if only the terror were to stop, a solution would appear. The terror stopped – and nothing. Israel’s excuses became increasingly empty and the naked truth was increasingly exposed. Israel does not want to reach a peace arrangement that would involve the establishment of a Palestinian state. This can no longer be covered up in the UN. And what did Netanyahu’s Israel expect the Palestinians to do in this case – another round of photo ops, like the ones with Ehud Barak, Ehud Olmert and Tzipi Livni that led nowhere? The truth is that the Palestinians have just three options, not four: to surrender unconditionally and go on living under Israeli occupation for another 42 years at least; to launch a third intifada; or to mobilize the world on their behalf. They picked the third option, the lesser of all evils even from Israel’s perspective. What could Israel say about this – that it’s a unilateral step, as it and the United States have said? But it didn’t agree to stop construction in the settlements, the mother of all unilateral steps. What did the Palestinians have left? The international arena. And if that won’t save them, then another popular uprising in the territories. The Palestinians in the West Bank, 3.5 million today, will not live without civil rights for another 42 years. We might as well get used to the fact that the world won’t stand for it. Can Netanyahu or Shimon Peres explain why the Palestinians do not deserve their own state? Do they have even the slightest of arguments? Nothing. And why not now? We have already seen, especially of late, that time only reduces the possible alternatives in the region. So even that weak excuse is dead. Yesterday, a coalition of Israeli peace organizations published a list of 50 reasons for Israel to support a Palestinian state. Assuming that you only accept five of them, isn’t that enough? What exactly is the alternative, now that the heavens are closing in around us? Can anyone, can Peres or Netanyahu, seriously contend that the regional hostility toward us would not have lessened had the occupation already ended and a Palestinian state been established? The truths are so basic, so banal, that it hurts even to repeat them. But, unfortunately, they’re the only ones we have. And so, a simple question to whoever will be representing us at the UN next week: Why not, for heaven’s sake? Why “no” once again? And to what will we say “yes”?